Let’s face it: transitioning to a new or replacement EHR may not initially seem like the most appealing enterprise. After all, the implementation process can be time-consuming, costly, and hard on employee morale -- particularly for smaller clinics with limited resources. However, these challenges are a lot easier to accept when you factor in the extensive rewards recouped by the vast majority of practices in terms of improved workflow and enhanced quality of care following a successful EHR implementation. Here’s what you need to know about why EHR software for small clinics is a worthwhile investment for today's orthopedic and spine practices. RevenueXL provides affordable Cloud-based EMR for small and mid-sized practices. 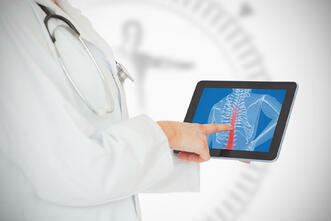 Check out our Orthopedic EMR for Spine Practices and Pain Management EMR Software for Pain Clinics. Access to and correct usage of patient Electronic Health Records (EHRs)/Electronic Medical Records (EMRs) provide major benefits to patients and physicians alike. When properly designed and utilized, Electronic Health Records can improve patient safety, increase clinical efficiency, reduce costs, allow seamless transfer of vital patient information, and allow physicians to better use their time and expertise treating patients. In order to optimize outcomes across a spectrum of factors, including everything from patient safety to quality of care, the AAOS further urges all members to adopt Electronic Health Records which are cost-efficient, well-designed, and widely available. EHRs which fail to meet the standards, meanwhile, can actually lead to reduced functionality, disruptions in the care continuum and wasted costs. Widespread EHR adoption is also projected to advance medical research by harnessing data across practitioners and patients in the most meaningful way. EHR systems can be good or bad for your practice, depending on which one you choose. Which obstacles are most commonly cited by practitioners? Initial cost, training, and inflexible templates top the list of deterrents to successful EHR implementation. What are the most beneficial attributes of high-functioning EHRs? 1. System customization -- along with the accompanying flexibility to meet the specific needs of each unique practice -- is a common theme. In reality, the act of customizing a generic EHR with thousands of different options can be a drain on your resources. This is why you must opt for specialty-specific EMR that comes pre-configured templates for spine specialists. 2. Cloud based EHR -- Physicians, particularly those with multiple office locations and/or part-time offices, also prize the ability to access patient records through a number of different channels making mobile functionality and cloud-based Orthopedic EHR popular choices. However, even the biggest fans of EHRs recognize that the costs of EHR implementation may initially seem prohibitive. This is why the AAOS recommends that physicians carefully weigh the the risks and benefits before choosing an EHR. EHRs may no longer be optional in the near future in terms of network participation. The sooner you plan to make the switch, that much sooner you can identify the best system for your practice, work through any implementation kinks, and begin seeing the payoffs. And remember: proper EHR training is widely considered to be an integral part of successful Orthopedic EMR implementation while failure to allow enough time for training and implementation can result in lack of access to incentive funds, as well as time-consuming errors along the way. Choosing between EMR systems can be overwhelming, but making a proactive, informed decision can position your organization for unprecedented success in the competitive specialty of orthopedics. RevenueXL's EMR for Orthopedics is designed to acknowledge the unique challenges and goals of each orthopedic and spine practice. Click here to learn more about how Revenue XL's EMR for Orthopedics can help you optimize your workflow and begin seeing results.